To migrate your mail from Mozilla Thunderbird to Microsoft Outlook, watch our video or follow the tutorial below. On the Mail Source screen, select Mozilla Thunderbird in the list, then tick the “Search for mail location” box, and click the Next button. If Aid4Mail finds the location of your Thunderbird mail, you will see “Local Folders” in the Explorer list. Make sure the “Include subfolders” box is ticked before clicking Next. Skip the Filter Options screen if you are using Aid4Mail Professional or Aid4Mail eDiscovery. 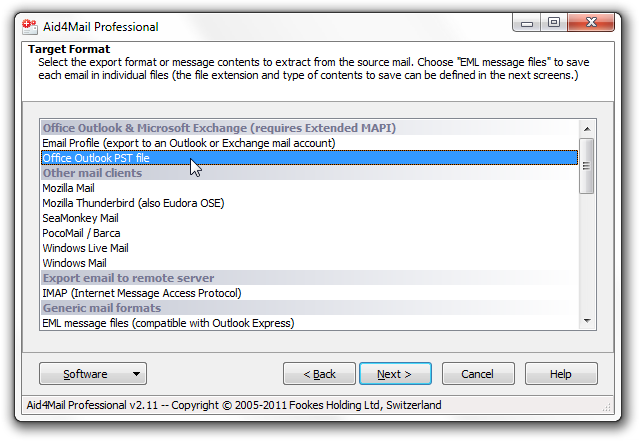 We will select the “Office Outlook PST file” option in this example. 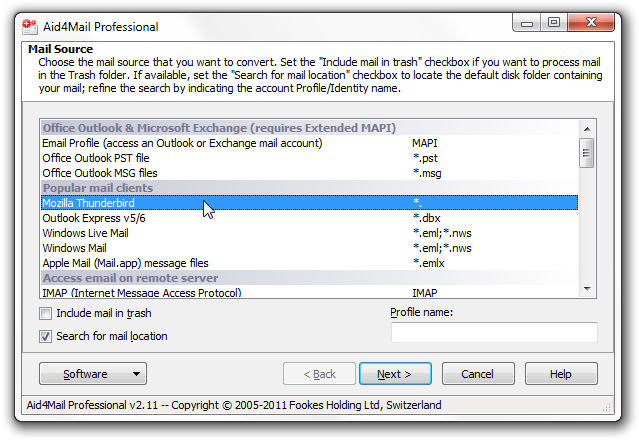 However, if you have Aid4Mail Professional or Aid4Mail eDiscovery, you may prefer to choose the “Email Profile” option instead to export your mail to an Exchange account or to your default Outlook profile. 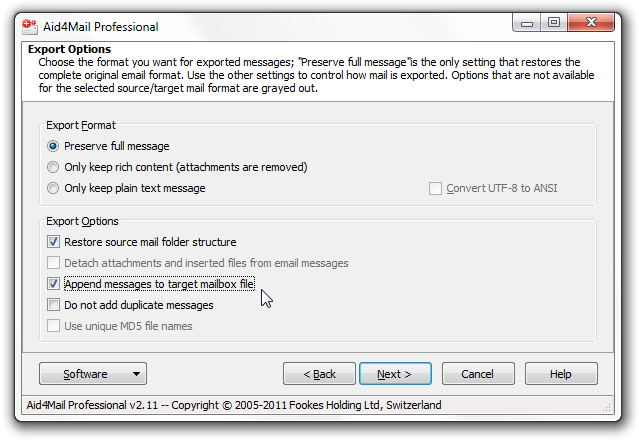 Aid4Mail will automatically set the appropriate target folder if Outlook is installed on your computer. 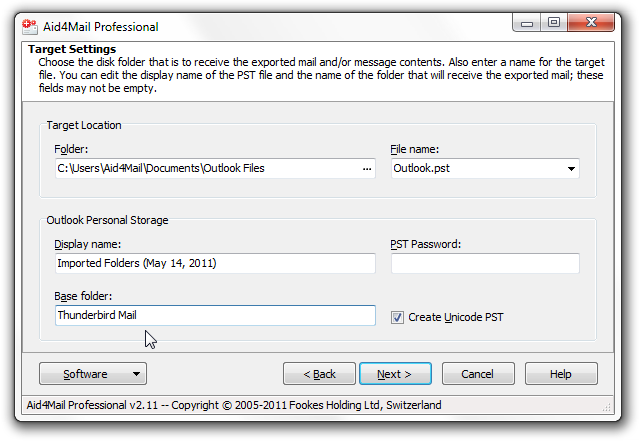 Choose the name for your PST file; the default Outlook profile stores email in the Outlook.pst file. If you are using Outlook 2010, Outlook.pst may be located in the “Documents\Outlook Files\” folder instead of under AppData. Enter a name in the “Base folder” field if you prefer to separate your imported mail from existing Outlook messages. For example “Thunderbird Mail” (without the quotes). Make sure the “Restore source mail folder structure” box is ticked. Also tick the “Append messages to target mailbox file” box if you want to add your mail to an existing PST file. This is the last screen in Aid4Mail. First, if Thunderbird is open, close it. 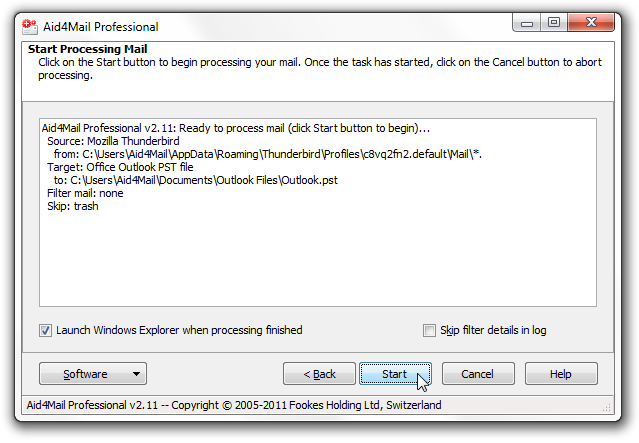 Then in Aid4Mail, click the Start button to begin the mail export task. Aid4Mail will display progress information as it processes your source mail. On finishing the conversion, Aid4Mail will indicate how many messages it has successfully processed. Open Microsoft Outlook. Often the Outlook.pst file will be open by default. If not, or if you chose to convert to a different PST file, then you can open the file in Outlook through File > Open > Outlook Data File. 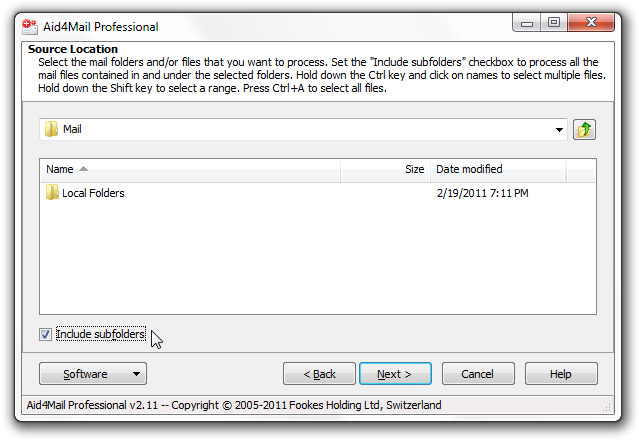 Browse the PST file’s folder structure until you find your converted mailboxes. If necessary, you can then drag-and-drop folders or individual messages to other locations.